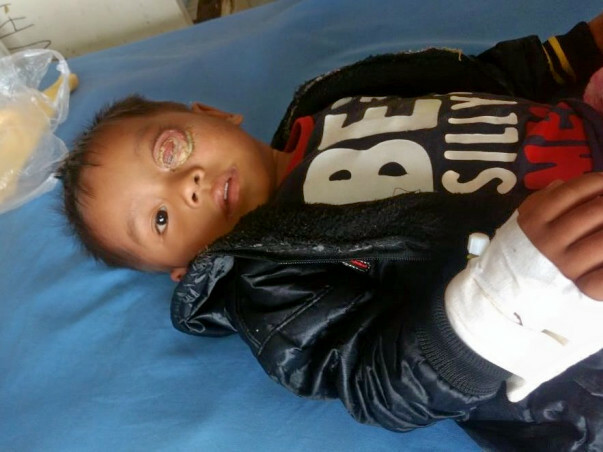 Keffrien Reang, 3, suffering by Retinoblastoma, son of Sanjit and Ruati Reang, 5 members family with two siblings Dulnangha Reang, 7, and Ebrillin Reang, infant. From Laldinga Para, Chailengta, Longtraivalley, Dhalai Tripura, India, PIN – 799273, 55 km away from district Head Quarter & 150 km away from state capital Agartala. He belongs to an underprivileged family, his parents hardly earn Rs.3500-4000/- only per month. 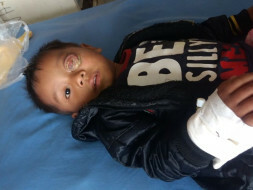 Decease start with a little spot in his left eye, 8-9 months ago, parents visit local doctors and hospital. Doctors prescribed some eye drops, eye ointment, and some antibiotics but it does not work rather than increase the decease. Then they visit Agartala Government Medical College and after a month-long diagnosis, they referred to Regional Cancer Hospital, Agartala. From there they referred to Sankar Netraloya at Guwahati and lastly at Dr. B. Borooah Cancer Institute, Guwahati. Where it’s diagnosed as a RETINOBLASTOMA (left eye) and it was blasted. 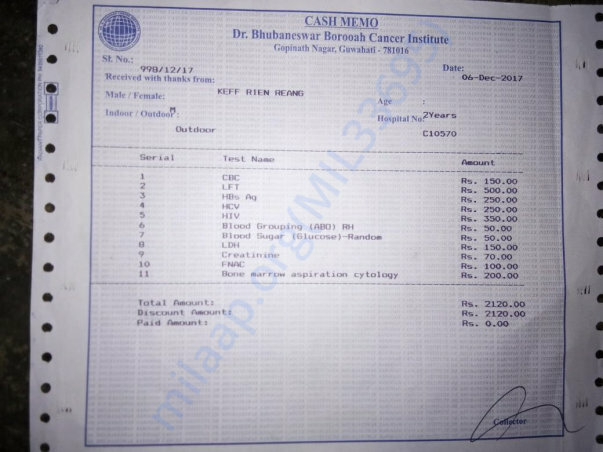 After few days of treatment at Dr. B. Borooah Cancer Institute of Guwahati, they left the hospital due to the financial crisis and back to home state Tripura. Now baby Keffrien is living with his life thread RETINOBLASTOMA. And I urge to all the kind souls out there to come forward and save this boy from going to the jaws of death. Thank you for the wonderful support that you have shown towards baby Keffrien. I have some unfortunate news to share with you today. Baby Keffrien had developed Malaria and was undergoing treatment for the same. His body had stopped responding to the medication and in spite of the doctors best efforts, his body could not take the stress. He left all of us in the early hours today, 6th June. Your timely support ensured that he received the best treatment possible. The funds raised via this campaign on Milaap have been utilised towards his treatment. Thank you for all the support and blessings to Keffrien. 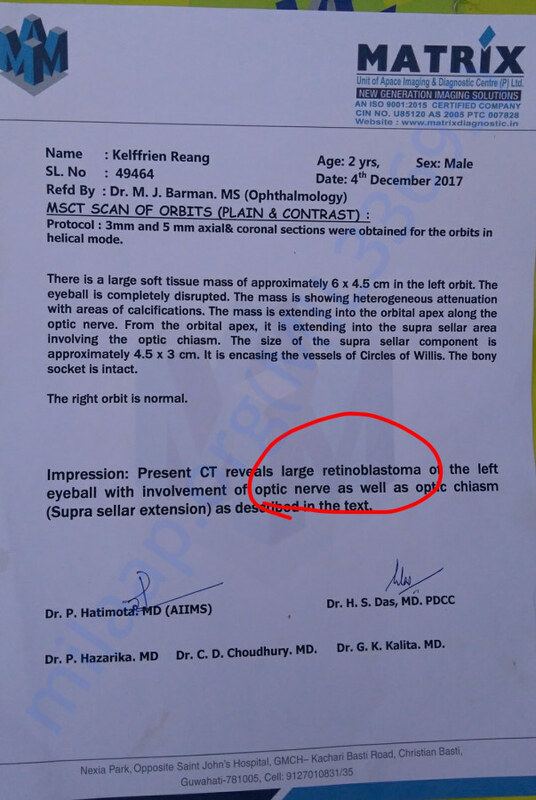 After his successful eye surgery last week at Sankar Netraloya, Guwahati, he is supposed to start his second phase of chemotherapy treatment at Dr B. Borooah Cancer Institute, Guwahati by this week. 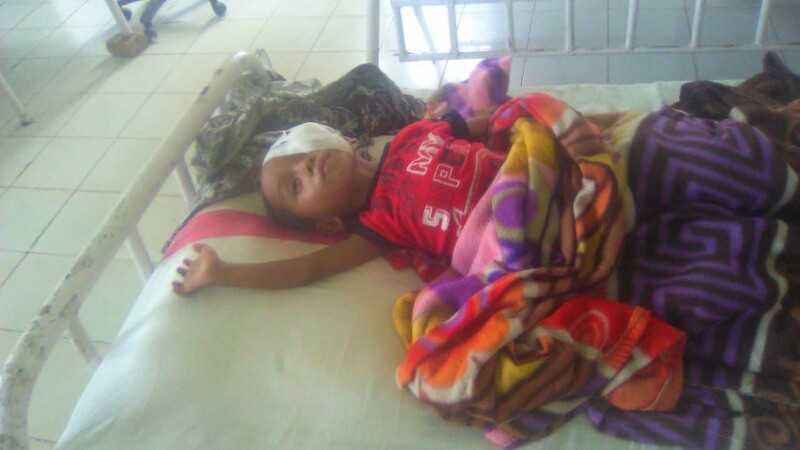 But he is suffering from Malaria and is hospitalized at Manu SubDivisional Hospital, Tripura for last few days. Slowly he is recovering, Kindly pray for him and support him. Thank you once again, be with us. Thank you all for all yours support and blessings. 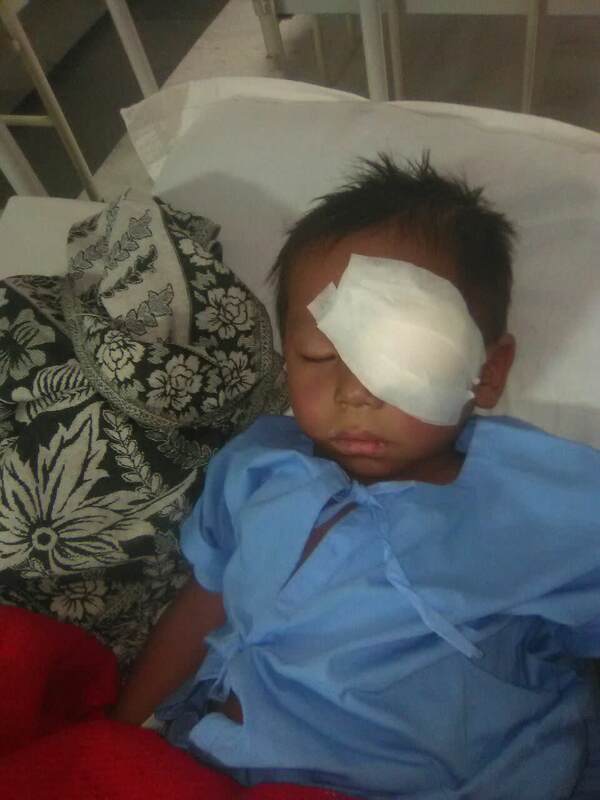 Keffrien has successfully completed his eye surgery last week at Sankar Netraloya, Guwahati. And he have to complete another phase of Chemotherapy treatment, and it suppose to be start from this week positively.